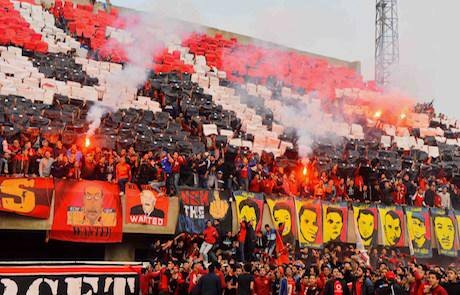 Feb. 1, 2016 - Cairo, Egypt - Al Ahly fans, the ''Ultras'', light flares and shout slogans in the club's training stadium, marking the fourth anniversary of killing al-Ahly fans known as the ''Port Said massacre''. Amr Sayed/Zuma Press/Press Association Images. All rights reserved.The Ultras recent re-emergence in a football match between Al-Ahly and Monana was phenomenal. Their famous flames lit up the stadium and their famous song “liberta” resurrected the moribund spirit of the January 2011 revolution. How could such youngsters emerge again, suddenly and confidently, after years of repression? How could they sustain themselves for more than half a decade of public vilification, massive incarceration, and torturous killing? What is the secret of such extraordinary endurance? Social movement literature does not seem to take the Ultras seriously. The reasons are plenty; their limited political ambitions and their association over non-political grounds (football) make their struggle seem negligible. But amidst these suffocating political conditions, this glimpse of hope should not be overlooked. Their pioneering reemergence amidst the gloomy silence of almost everyone else encourages us to rethink our understanding of social movements and how worthy they are of serious analysis. Might it be the case that traditional, i.e. politically-oriented, social movements like Kefaya or the Revolutionary Socialists, for example, are no longer the ideal model of social organization? Are communities that are not directly political more effective today? More capable of resisting repression and able to maneuver and challenge the state’s iron fist? Should we give up our desperate hopes in traditional movements and look to new social movements such as the Ultras? "New Social Movements" is a term Alberto Melucci coined to describe movements that seek not to demand changes in the political agenda, but to rather construct this change in-practice; to practically demonstrate alternative possibilities of social and political praxis through their very being. These movements are thus less concerned with intentions than experiences, less concerned with power than resistance, less concerned with goals than actions. They should not be analysed through traditional frames that focus on strategies, resources, and mobilisation, but new modes of analysis that take the movement’s symbolic production as seriously as its tangible strategic attainments. This Meluccian framework enables us to understand how such groups of teenagers can sustain their existence as a serious challenge to a regime whose political powers are incomparably superior; for the power of the Ultras, obviously, lies not in its political front, but in the social bonds that keep the group intact despite their recurrent political defeats. Fleshing out these bonds requires an empirical investigation that would be too challenging at this point in time given the current autocratic regime and its violent restrictions on social movement research. However, there are two recently published analysis that at least facilitate the imagination of how such bonds function in social action: Khalil Anani’s Meluccian analysis of the Muslim Brotherhood’s ‘inside’, and Dalia Ibrahim’s analysis of the Ultras Ahlawy. The first is useful for its theoretical framing of how social bonds can be a means of resistance. The second is useful for the application of such a frame on the group, despite its limited engagement with the political implications of these bonds. Khalil Anani explores the secret of the Muslim Brotherhood’s endurance through eight decades of regime repression. To that end, Anani draws on Alberto Melucci’s ‘new social movements theory’ to conceptualise the Brotherhood as a cognitive framework embedded in its members everyday activities. The Brotherhood, Anani argues, is one of those movements which recreate world possibilities through the implementation of their alternative agenda, not on the political level, but on the individual member: in the usra (fraternity), the mosque, the neighborhood, and even the family. Each member of the Brotherhood, thus, is disciplined and nurtured to become an embodiment of the Brotherhood’s ‘alternative’ order, a suggestion of an alternative way of politics. It is through such ideological embeddedness in the everyday that the movement becomes capable of keeping its members homogenous, even when they are forced through repression to cut internal connections and stop collective activity; for the Brotherhood’s collective action is ‘individual’ at its core. Parallels could not be more vivid. In fact, the Ultras connections are even more embedded in the everyday: whenever he watches football, discusses it with his friends, or shares it on his everyday social platforms, an Ultras member reiterates his identity as a football fan – the core identity feature of the group. Collective action, of course, gives spirit to this identity, reifies it, reinforces the ties that hold the group as a collective ‘we’, but in no way is it necessary for the collective to remain intact; for watching an Ahly match from his very own television automatically connects this fan to his fandom group. As such, the group can maintain its cohesion and prolong its lifespan through years of being abandoned access to the field where it is most vivid (the stadium). On the latent level, the group can remain – albeit hibernated – in the souls of every member: in his individual rituals, imaginations, actions, and relations to football. Ibraheem’s research starts from this point of departure: the individual. Fortunate to have conducted fieldwork research before the situation became this bleak, she could point out three key ideologues that tie the movement’s abstract ideology with its members lives: nationalism, fraternity, and representation. The first ties the individual’s ‘club’ loyalty to a higher loyalty to the nation, expressed in his superior loyalty to the national team (which comes before any club loyalties). The second ties the fans together as one ‘brotherhood’, in which part of being an Ahly fan is being part of this fandom community, obliged to follow its obligations and care for its fellow members. The third ties the fun experiences of cheering, singing, and other acts of performing to the presentation of the group to the public; levelling those seemingly mundane acts to the highest level of seriousness while still being part of the fun, cheerful experience that defines the group’s aspired image. These youngsters are fans. Indeed, they take the game very seriously; but their nurtured sportsmanship makes them highly immune to the dramas of defeat. They are rather trained, through their very fandom praxis, to fall and rise again. This is no doubt one reason that makes their endurance plausible; they approach resistance not as a political act, but a sports game – you win, you lose, and it makes very little difference; for what matters is the experience, what matters is the game.